Includes lessons learned from Oregon, Washington, and federal government and focuses on how the scientific understanding of harmful algal blooms can inform domoic acid monitoring for seafood safety in California. 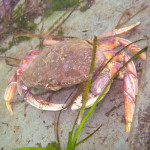 In 2015 and 2016, elevated levels of domoic acid were observed in major commercial and recreational shellfisheries in California, including Dungeness crab and rock crab, leading to health advisories and fishery closures during the 2015/16 season. Given California’s changing ocean conditions and increasing threats to coastal economies, the State is interested in exploring opportunities to bolster its existing seafood biotoxin sampling and harmful algal bloom (HAB) monitoring programs, as well as advance our understanding and ability to predict HAB events and fishery impacts. Provide scientific guidance on how to add capacity and support state needs, as described below. determines how the scientific community can best add capacity to the State as we prepare for future toxic bloom events in California.